Kristen, right, and me. Just before I got my nose pierced. So the first thing you'd remember about my dear friend Kristen is her smile. At least that's the thing I remember about the day I first met her. It's as wide as the Amazon. And so bright. You'll probably also note that she's beautiful and really put together. Like she's just walked off the pages of an Anthropologie catalog. Qualities I assumed would preclude her from wanting to be my friend– as I am often, you know, not put together. A little schlumpy. But she is my friend. You'd quickly learn about her weird obsession with cats and the color aqua. How her nails are always manicured and her house always, always covered in glitter. She's a passionate person, too. Passionate about being a mother and raising kind, resilient children. Passionate about her education and growing her skills as a nurse. Passionate about advocating for those who struggle with eating disorders and other mental health issues. When you talk to Kristen. She listens. Really listens. Makes you feel as if you're being heard for the first time. And understood. So naturally, people gravitate to her. We became friends because we both needed someone who spoke our language– one of morbid humor and hopeful cynicism. Back in York when our first kids were just babies, we'd both joined a local Mom's group and became friends on Facebook. She must've read something I wrote here about my own struggles with depression, because one day she messaged me and asked if I'd be willing to listen. And I'm always willing to listen. So she'd share her story and I'd send her Parry Gripp videos. And she'd share some more. And I'd send her cat emojis. And so it went. We kind of dug deep into our souls right at the start. We'd watch each other's kids. Drink cup after cup of coffee picking over the detritus of our lives. Lamenting how impossible motherhood could be some days. Analyzing the days we felt like the world was just the worst. And celebrating the ridiculous moments that made it better– like caroling or the kids pushing cats around in doll strollers or Convos With My 2 year old. Then, you know, life evolved. Forcing our friendship to stretch across a distance. Which hasn't been easy. I was a bridesmaid in her wedding last fall and in January I drove up to York at 2 a.m. to witness the birth of her son in her living room no less (he was immediately covered in glitter). But we don't live three minutes from each other anymore. She works weekends and with the girls in school it was tough for me to visit during the week. We text sporadically. It's just not the same. 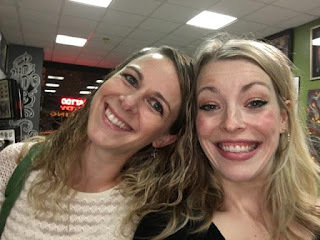 I share all this about my friend Kristen– because it's important you get to know the person I know before I share the next part. She's generous. Unflinching in her honesty. She's one of the strongest people I know. She's a force. A lioness. But she's also spent long stretches of her life bearing the weight of depression. Debilitating depression. 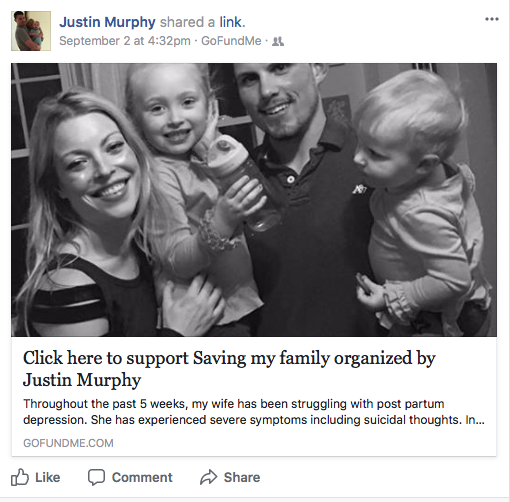 "Click here to support saving my family"
"Throughout the past 5 weeks, my wife has been struggling with post partum depression. She has experienced severe symptoms including suicidal thoughts. In the last 5 weeks, she has been hospitalized on 3 separate occasions. She has tried all forms of treatment including partial hospitalization, intensive outpatient therapy, group therapy, and expressive therapy. Each time that she has been released from the hospital her suicidal thoughts become more serious. The program that has been recommended is a long term inpatient program. This program is known as residential treatment for mental health Though we have great insurance, there is absolutely no coverage for this type of program. Our insurance would pay for this treatment if my wife had some type of substance abuse issue, but she does not. They will not cover this treatment. For her to attend the program, we will pay approximately $50,000 out of pocket. We are a young family with 3 children. I am looking to my community for any support that is available. I will continue to appeal our insurance claim, look for financial assistance, and save as much as I can. With my wife being sick and not working, we are risking bankruptcy and the loss of our house, let alone paying $50,000 to save my family. If you are unable to financially contribute, we are asking for prayers. Thank you for all that you can do to help." I felt as if I was going to be swallowed up by the bedroom floor. I knew Kristen had been struggling with postpartum depression. I knew she was struggling to find any light. Any hope. Any possibility for a life free from the shackles of her dark matter. But I didn't know how bad it had become. We hadn't been in touch in recent weeks. I tried texting a couple times a week just to check in and say hi. Sometimes I'd hear back from her. Most of the time I didn't. Twice I'd planned to visit her in York this summer– when we lived up there, her daughter and my girls were like sisters. But the day before one visit she'd was hospitalized. Hearing voices. Thinking about death. The second visit was more tentative. She told me she would be around and then I didn't hear from her. I tried not to take any of it personally. I know depression intimately. I know how it draws a dark curtain around you. How it forces you to isolate. To ignore. To reject. Even people you care about. Maybe even especially the people you care about. It's an insidious beast. Creeping about, telling you untruths about yourself. "It's an acute pain when you are intimately in touch with that gray dense bog... the tarpit, the cancer ... its like ancient mythology where the souls of the dead are just under the surface of the river Styx but you can only see them ... you can't reach them." And that's the thing. I feel like I can't reach her. And that's pretty terrifying. Not that I'd ever have the right words or have the right numbers to plug in to solve the equation of her pain. It's not that simple. And for Kristen, I know the pain in her heart, in her brain is deeply rooted. I'm afraid for her. Afraid for her husband and for her children. Because the stakes are so high. This is her life. Their lives. I don't want to lose her. And I don't want our planet to lose her. She's good for us, you know? I've felt so overwhelmed recently. Like, there's just too much happening in life. Vacations, anniversary parties, showers, birthday parties, weddings, school. It's happy stuff, mostly. But I can't stop my brain from churning about what needs to be taken care of. It was hard last week– with both girls at school. The house was so, so quiet. It was isolating. I freelanced, but mostly felt like I'd just been fired from my real job. I'm mourning the days I won't get back. The little years went by so quickly. Too quickly. I've felt like I should've had a better life plan. Because I've known this day was coming. I've felt powerless. Like I can't track the direction I'm headed. In situations like these, I'd often turn to Laura, who I know has her own stresses– what with a newborn and her oldest getting married in a week. Or Kristen, who I can't reach. And I know most of you don't know my friend Kristen. But I need you to trust me that she's good people. And her little family– Justin and the three littles– they're good people. They're good people who don't have an extra $50,000 lying around to pay for the residential treatment program recommended for Kristen. I know there are a lot of different options available to individuals who need treatment for mental health. Kristen has explored most of them. She needs something more. And if she doesn't get something more ... I'm afraid for her life. I don't think her suicidal thoughts will go away without intensive care. I know that there is so much need right now. That everyone just went back-to-school shopping and that the devastation down in Texas is so massive and we want to do our part. That there will always be the next thing that requires our time, attention or money. But I'm asking you ... you, the person reading now ... to consider making a donation toward Kristen's care. I know with all the demands facing us right now, I won't be able to contribute much, but even a little counts I think. And if you don't have the means right now, well, please say prayers. Or have a chat with the higher power or send some good energy out in the universe or do whatever it is you do when you feel powerless but want things to be better. Do that thing. And thank you. Because I need my friend to stick around.